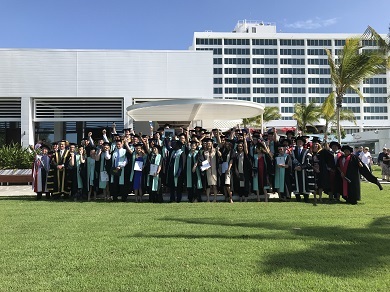 An extra 42 graduates have been inducted into the CQUniversity alumni community after crossing the stage to receive their testamurs in Townsville on 4 April. Ben Oswin, 30, was one of the graduating students, completing his studies with a Bachelor of Paramedic Science with a distinction. “I’m the second one in my family to graduate to university level; I did 10 years of trade prior to this...I didn’t have a very academic background at school,” he said. Mr Oswin was also the recipient of the Associate Vice-Chancellor’s campus medal, an award that recognised outstanding academic achievement as well as contribution to community. The star student was an active member of the university’s Rural Health in the Northern Outback club. He took a number of trips to northwest communities at Richmond and Hughenden. “Some of these farmers and the general population out there rarely get to see a doctor or specialists,” Mr Oswin said. African born Tobi Akinbiyi, 31, was one of four international students who graduated. Having moved to Australia in 2016, Mr Akinbiyi was awarded a Bachelor of Information Technology, majoring in network security.